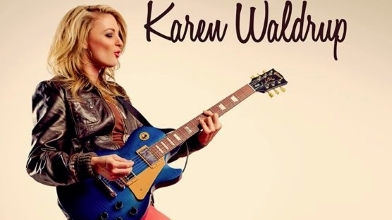 New Orleans native Karen Waldrup is a full time touring country artist. Although she loves writing and working in the studio, her passion lies in live performances.For the last eight years, Karen has been touring and sharing the stage with artists such as Rodney Atkins, Carrie Underwood, Sara Evans, Gloriana, Josh Thompson, Hank William Jr., Terri Clark & Clay Walker. Karen prides herself in being a touring act and has traveled to Belize, Switzerland, Honduras and Guatemala to perform.